This recipe comes from my mum and probably from her mum before her and so on! 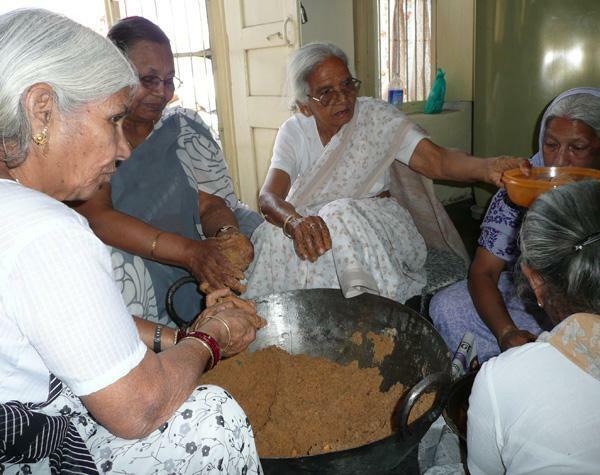 Pictures show her making laddoos with her friends, she is in the centre of the picture, 3rd from left. The last two composite pictures show the full process. Gum resin is supposed to be good in winter months. 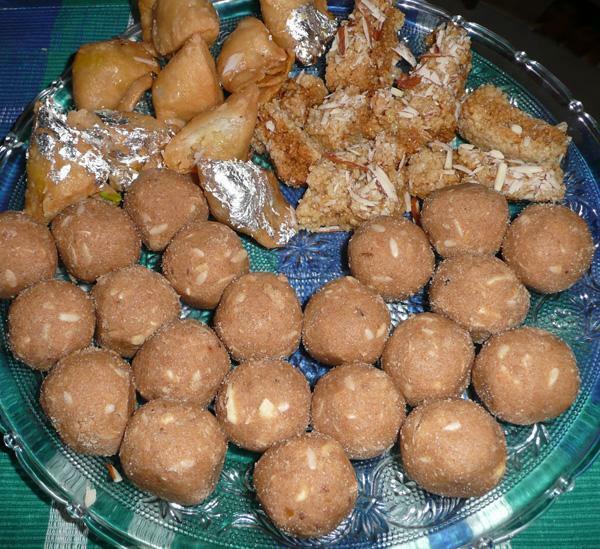 The laddoos are so delicious that you have to try, at least once! Gum resin is sold in Indian shops in UK as 'Chargoond', in 100 gm. packets. 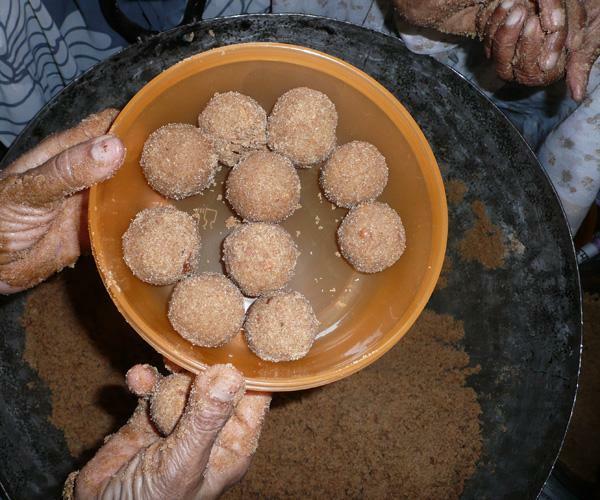 To make plain atta laddoos, just omit adding gum resin - Mamta. *All these 4 ingredients should make roughly 1 cup all together. They can be chopped in a nit chopper. Dry fry puffed lotus seeds in a wok or kadahi, until lightly brown. They will be crisp when cold. Break them roughly with a rolling pin or in a food processor. Do not powder them. Keep aside. Dry fry coconut, keep aside. Dry fry melon seeds. Keep them covered, they splutter all over. Break gum resin coarsely (unless it is already in small pieces) by placing it between two folds of a towel and pounding gently with a rolling pin. You must not powder it. It should be coarse and granular. Heat ghee in a wok or karahi. Deep-fry gum resin on medium heat, stirring it up all the time, to ensure that every single piece is fried. Uncooked gum is sticky! It fluffs up to almost double very quickly, within seconds. Lift it out of the ghee, as soon as it fluffs up. Otherwise, it will burn and get bitter. Keep aside on a plate. Dry fry melon seeds, keep aside. Heat remaining ghee again. Fry flour in it, until it is light brown and emits 'roasted' aroma. Ghee separates from the flour when it is ready. Turn heat off. Add fried gum to the flour and continue stirring. Add and mix ginger powder. Add rest of the ingredients (cardamoms, melon seeds, coconut, pistachios, almonds, cashew nuts, sugar) and mix well. Allow to cool until is it can be touched by hand comfortably. 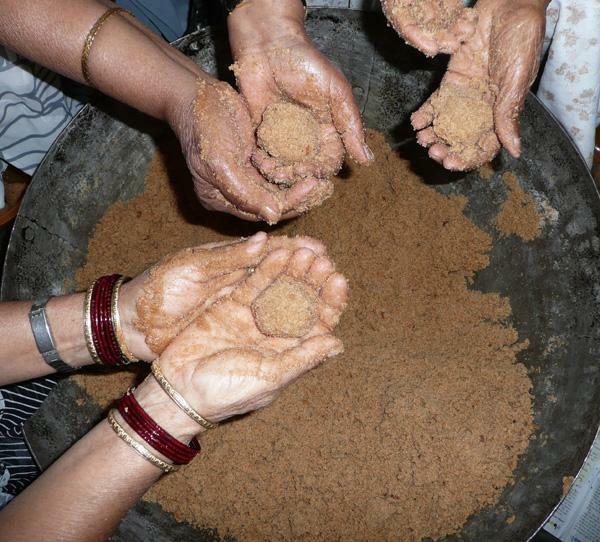 Take small handfuls in your palm and roll them into balls or laddoos, approximately 1 1/2 -2 inch in diameter. **Makhanas or Gorgon Nut or Fox Nut(Euryale ferox) are the seeds of a plant from lotus family, which has purple flowers not dissimilar to lotus or water lilly flower. This is why they are sometimes confused with and described as puffed lotus seed, which they are not. The plants are cultivated in ponds all over northern India, especially in Bihar. The Makhanas that we use as food are the puffed kernels of the seed pod.